Culture can be defined as the attitudes and social norms common to a group of people. It underlies various aspects of our social behaviour and affects our reasoning. In this project, we investigate how social robots are percieved in different cultures and what happens if they attempt to leverage knowledge of a perosn's culture and adjust their interactions to match the person's culture. Elaheh Sanoubari, Stela H. Seo, Diljot S. Garcha, James E. Young, Verónica Loureiro-Rodríguez. “Good Robot Design or Machiavellian? 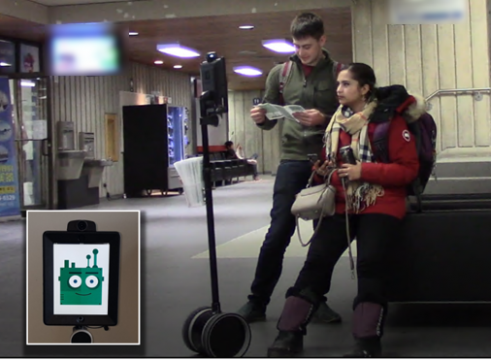 An in-the-wild robot leveraging minimal knowledge of passersby’s culture”. In Proceedings of alt.HRI track, ACM/IEEE International Conference on Human-Robot Interaction. 2019. Elaheh Sanoubari, James E. Young. “Hi human, can we talk? An in-the-wild study template for robots approaching unsuspecting participants" in proceedings of the Workshop on the Social Robots in the Wild at the 13th Annual ACM/IEEE International Conference on Human-Robot Interaction. ACM. 2018. Elaheh Sanoubari, James E. Young. "Explicit, Neutral, or Implicit: a cross-cultural exploration of communication-style preferences in human robot interaction" In adjunct Proceedings of the 13th Annual ACM/IEEE International Conference on Human-Robot Interaction . ACM. 2018.